The Northern Saw-whet Owl is a small owl, but don’t let their small stature fool you! It just screams attitude with bright yellow eyes staring at you from its large cat-like face. You will probably not spot this bird as its coloring blends in with its habitat, but you might hear their unique call echoing through the forest. Saw-whet Owls are excellent rodent hunters and help keep rodent populations down. Since these owls can nest in nest boxes, we can observe them and learn more about their behavior. This species is very secretive, so little is understood about the population trends. There probably has been a decline due to forest habitat loss. Put up a Northern Saw-whet nest box. You can build your own box with these blueprints. Avoid the use of poison to control rodent populations as these owls may become poisoned by eating the tainted rodents. Avoid cutting down old, dying or dead trees as they can be perfect places for owl nests. Support protected areas in the Edmonton area such as those conserved by EALT! You can donate or volunteer your time to help with conservation efforts! The Northern Saw-whet Owl has a distinctive song of “too-too-too”, used to advertise territory and courtship typically heard from January to May. They also make other sounds including high “tssst” calls, and snapping their beak. Click here to listen to the different calls of the Northern Saw-whet Owl. Northern Saw-whet Owls are found in southern Canada, throughout the United States and into Mexico. Some are year-round residents and others are long-distance migrants which usually spend the winter in the States. This species prefers to reside in mature forests, nesting in deciduous trees and roosting in conifer trees for protection. Despite this preference, this species has been found nesting in other habitats including coniferous swamps, disturbed forests and riverside forests like our own River Valley! The Northern Saw-whet Owl will also nest in nest boxes successfully. Northern Saw-whet Owl nesting behavior is partially understood but more research is needed due to its elusive nature. Males draw in females to a potential territory with their “too-too-too” call. The female probably builds the nest but the male helps choose potential sites. The females do the nest incubation and brooding while the males do all the hunting. Babies are born white and semi-helpless with closed eyes. They will typically find new partners every year. Owls are predators and the Northern Saw-Whet is no exception, targeting mice and other rodents. If migrating, the Saw-whet may target birds, insects or even inter-tidal invertebrates if the bird is near the coast. Northern Saw-whet Owls are prey for other larger birds of prey including Great Horned Owls and Peregrine Falcons. Although there is no consensus as to why this owl species was given its name, it is theorized that one of its calls sounds like sharpening a saw on a whetting stone. The migrating owls even cross large bodies of water. One owl flying over the Atlantic Ocean landed on a ship 70 miles from land. The oldest wild bird on record was at least 9 years and 5 months old. After the youngest chick in the nest is 18 days old, the female will leave the nest, and it’s young to the male to finish raising. Without the female to clean the nest, it is full of feces, pellets and rotten meat 10 to 14 days later when the young leave the nest. These owls are hard to spot. The best way to find one as a bird watcher is to look for flocks of songbirds diving around a single point. A predator is definitely there! 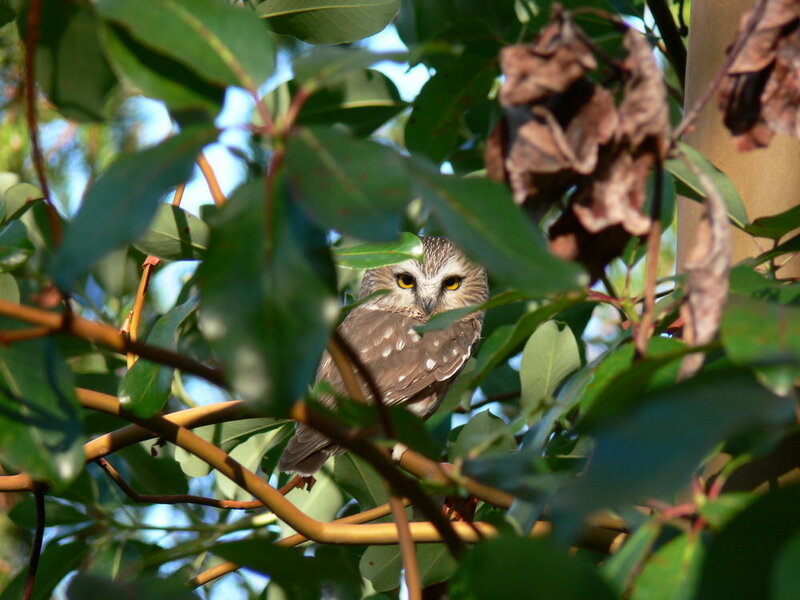 Help conserve homes for Northern Saw-Whet Owls by donating to EALT today! BirdLife International 2016. Aegolius acadicus. The IUCN Red List of Threatened Species 2016: e.T22689366A93228694. Downloaded on 25 October 2018. Northern Saw-whet Owl information page from All About Birds. Northern Saw-whet Owl information page from What Bird. The Least Flycatcher is a small songbird species known for its hawking behaviour; darting out from a branch to catch insects on the fly. You may not have seen a Least Flycatcher, but you likely have heard one and didn’t know it! This species is widespread in the Edmonton area, for now. Least Flycatchers eat insects! They eat a variety of insects including midges, ants, flies, butterflies, beetles and even some mosquitoes. They are sensitive to forest disturbance. This means they can be used as in indicator of environmental damage; if they aren't doing well, something is wrong in their environment. In Canada and around the world, insectivorous birds like the Least Flycatcher are in steep decline. From 1970 to 2012, insectivorous bird populations in Canada declined an average of 70%. This is due to pesticide use, reductions in insect numbers, habitat loss, and climate change. The Least Flycatcher is doing fairly well in the Edmonton area, but not as well in other parts of its range. Avoid using pesticides in your garden, and especially near water bodies. Support protected areas in the Edmonton region (such as EALT!). You can donate or volunteer your time to help with conservation efforts. Reduce your carbon footprint to reduce impacts of climate change on Least Flycatcher habitat. Small size. The Least Flycatcher varies from 12-14 cm in length, has a wingspan of 20cm, and weighs around only 10g! Olive gray body with a pale underside. Yellowish to white wing bars. Males are slightly bigger than females but the difference would not be noticeable in the wild. Hawking behaviour: perching on a branch and darting out to catch insects before returning to perch again. The Least Flycatcher, along with several others in the Empidonax genus, are virtually identical by color. The best way to tell apart these species is by song. You can hear the “Chebek! Chebek!” of the Least Flycatcher echoing through almost any forest in the Edmonton area. They may also make a shrill scream to indicate stress or danger. Click here to listen to the many sounds of a Least Flycatcher. Least Flycatchers can be found in forests across North America, from Mexico to the boreal forest. They prefer mid successional to mature deciduous forests with some shrubs and some open space in the understory. You could find them in almost any forested area in the Edmonton region. In the winter, the Least Flycatcher migrates to Central America, so you will only find them in the Edmonton area from May until September. They nest in clusters of up to 30 territories. This could provide safety for inner territories as well as extra mating opportunities for all. They eat insects of all sorts, including: midges, ants, flies, butterflies, beetles, and mosquitos. The oldest known flycatcher was 8 years old when caught during banding in Virginia! Help conserve homes for Least Flycatchers by donating to EALT today! BirdLife International. 2016. Empidonax minimus. The IUCN Red List of Threatened Species 2016: http://dx.doi.org/10.2305/IUCN.UK.2016-3.RLTS.T22699854A93751971.en. Downloaded on 23 May 2018. The Tree Swallow is a common sight in central Alberta. This distinctive blue and white Swallow gracefully chases insects above rural agricultural fields. They spend almost all of their time flying and catching insects. Despite how common they are, they are in decline. Tree Swallows eat mosquitoes and other flying insects. They frequently use nest boxes so we can watch them grow and learn about them. Tree Swallows are in steep decline (49% from 1966 to 2014.) Like other insectivores, this is due to pesticide use, habitat loss, and climate change. Due to their visibility, Tree Swallows act as an indicator of environmental harm. Don’t use pesticides in your garden or farm, particularly neonicotinoid pesticides. These wash into natural waterways and reduce insect numbers so the Tree Swallows don’t have as much food to eat. Put up a nest box. Tree Swallows like open areas such as agricultural fields. Reduce your carbon footprint to reduce impacts of climate change. Vivid blue back, head, and wings, though these may appear grey in young birds. Very small and flat bill. Very long wings compared to the rest of their bodies. Small size: Tree Swallows are 12-15 cm in length, up to a whopping 25g in weight, and a wingspan of 30-35 cm. Extreme grace and agility while flying. Will dive and perform other acrobatic maneuvers to catch insects. White underside and vivid blue upperparts. Tree Swallows have a chattering song that they frequently make while flying and while stationary. Because they often gather in large numbers, they can make quite the racket! Click here to listen to the many sounds of a Tree Swallow. You can find Tree Swallows in all parts of North America except the high Arctic. They breed from the tundra to the central United States, and they winter throughout most of Central America. Despite their name, Tree Swallows prefer open areas like agricultural fields or wetlands. They get their name from their tendency to nest in tree cavities. This protects their young from predation. They like to be near wet or open areas because wetlands produce much of their preferred food. The female builds the nest. They may have up to 7 young, and they may nest twice in one season. They are very social and like to breed in large groups. Sometimes they take the same mate year after year. They are migratory. They breed in Canada, spend a couple of months resting up in the central USA, then fly to Central America for the winter. They primarily eat insects that they must catch by flying. This includes a wide variety of insects including: dragonflies, damselflies, flies, mayflies, ants, wasps, beetles, stoneflies, butterflies, and moths. In the nest, their eggs and young may be predated by raccoons, black bears, chipmunks, mink, weasels, deer mice, feral cats, American Kestrels, Common Grackles, American Crows, and Northern Flickers. Outside the nest, adult Tree Swallows can be predated on by other bird species, including: Sharp-shinned Hawks, Merlins, Peregrine Falcons, and Black-billed Magpies. The oldest known Tree Swallow was 12 yrs when caught during banding in Ontario. Tree Swallows use nest boxes. As forests and dead trees are cut down, these birds lose habitat. You can put up a nest box to counter this. Tree Swallows are some of the most graceful birds in the air, relying on incredible acrobatics to catch insects while flying. Help conserve homes for Tree Swallows by donating to EALT today! Tree Swallow. All About Birds; Cornell Lab of Ornithology. BirdLife International. 2016. Tachycineta bicolor. The IUCN Red List of Threatened Species 2016: e.T22712057A94316797. http://dx.doi.org/10.2305/IUCN.UK.2016-3.RLTS.T22712057A94316797.en. Downloaded on 23 May 2018.
are a Species at Risk. It is imperative we protect their habitat, to prevent them from disappearing entirely. are an important part of their ecosystem, eating insects and larvae. are awe inspiring to see in their natural habitat and exciting to watch - especially when they have babies riding around on their backs! Donate to help EALT protect crucial wetland habitat. EALT protects wetland habitats important for horned grebes and other waterfowl. Horned grebes have been spotted at our Ministik and Glory Hills natural areas. Help keep your watershed healthy! We all live in a watershed and what we do in our very own yards has an impact on wetlands nearby. Horned grebes are 31–28 cm long with a short, pointed bill. The plumage of the male tends to be brighter. Its winter plumage is black and white and characterized by a black crown and white cheeks. Chicks have dark stripes, which are particularly visible on the head and neck. Like other grebes, P. auritus must run along the surface of the water in order to take-off. Horned grebes fly quickly with rapid wing beats. Their feet and neck are outstretched during flight and their head tilted downward. This bird has different calls for greeting, mating, and warning. Click here to listen to the many sounds of the Horned Grebe! Horned Grebes are found across North America, with most of its breeding range in Canada, extending from the Yukon, through the Northwest Territories, Nunavut, British Columbia, Alberta, Saskatchewan, Manitoba and Ontario. They live in small freshwater ponds and marshes containing a mixture of emergent vegetation and open water and have been observed in urban ponds in Edmonton and St Albert. Chicks are able to swim and dive immediately after hatching, but usually spend the majority of time on their parent’s backs during the first seven to 10 days. They nestle between their parent’s wings and ride along while the parents swim. They may even stay onboard during dives. Horned Grebes eat aquatic insects, fish, crustaceans, and other small aquatic animals. Young are fed adult’s feathers, a behaviour unique to grebes. This forms a plug of feathers in the stomach and may function as a filter or may hold fish bones in the stomach until they can be digested. In order to be concealed from predators, they build cryptic, floating nests in mats of emergent vegetation. Grebes may be preyed upon by hawks, osprey, weasels, fishers and other predators. Horned grebes are excellent swimmers and divers. During dives they may stay underwater for up to three minutes and travel 150-200 meters. They sleep by resting their neck on their back and tucking one foot under a wing and then use the other foot to manoeuvre in the water. Grebes are awkward on land and spend the majority of their time swimming or floating on the water. Their legs are set so far back on their bodies that they are hardly able to walk. Help conserve homes for Horned Grebes by donating to EALT today! Common Loons are hard to miss on Canadian lakes - if you don't spot these large tuxedo waterbirds in the middle of the lake, you are sure to hear its yodeling calls. Donate to help EALT protect wetland habitat important for loons. EALT‘s natural areas contain excellent wetland habitat and the small lake at Glory Hills is home to a nesting pair of loons. Use steel fishing products instead of lead weights and hooks. Lead weights are easily lost and then consumed by fish and waterfowl. High levels of absorbed lead causes damage to vital organs and tissue. Fish and birds with lead poisoning become sick and easy prey. Lead poisoning works its way up the food chain and can be fatal to everything from fish, to loons, to bald eagles. Leave no trace. Abandoned or littered fishing line and hooks can also cause injury and death to loons when they become entangled in it. Give loons space when boating. Loons dive under water when approached by a boat, but commonly have young ones riding along on their backs. Loons and their chicks can be injured by boats and propellers. Both male and female have a black head and bill and a black white checkered back and white ‘necklace’ around the throat. Common Loons are relatively large and swim low in the water, which helps distinguish them from other waterfowl. Loons have 4 distinguished calls: tremolo, yodel, wail, and hoot. Each call has a distinct message. The tremolo is used when the loon is alarmed, or to announce its presence; the yodel is used by a male loon to announce and defend his territory; the wail is the 'marco polo' of the loon world; and hoots are used to keep in contact, such as between parents and chicks, or between mates. Click here to listen to the different loon calls. Common loons are found throughout Canada, breeding on quiet, freshwater lakes 5–50 hectares in size. They inhabit lakes with an abundant supply of small fish. Loons are sensitive to human disturbance. Common loons migrate to warmer areas along the Pacific and Atlantic coasts and can be found on lakes, rivers, estuaries and coastlines. Loons are monogamous and typically stay together for about 5 years. Loon mates return to the same lake separately and if one doesn’t return, the other loon will find another mate. The male loon uses his yodel to define his territory and notify other loons to stay out. Loons leave their chicks at about 12 weeks of age. The parents migrate, leaving the young to flock together to migrate a few weeks later. Juveniles overwinter on the coast, and stay there for 2 years. In year 3, they return north, but do not breed until they are about 6 years old. Loons eat fish, frogs, crayfish and other aquatic animals. Loons pack away a lot of fish! A loon family with 2 chicks can eat about a half-ton of fish over a 15-week period. Loons spend almost all of their time in the water so do not have very many predators. Loon chicks are prey to large carnivorous fish, gulls, crows, and eagles. Loons can live up to 15 - 30 years! Loons have solid bones, unlike other birds, which make them less bouyant and better divers. When diving, they quickly blow air out of their lungs and flatten their feathers, making them super fast and efficient underwater. While diving, the loon's heart even slows down to conserve oxygen! Loons need a long runway to build up enough speed for lift-off. Loons are fast in the air too, flying at speeds near 112 km/hr! Help conserve homes for Common Loons by donating to EALT today! Great Horned Owls are Alberta's Provincial Bird making them a highly iconic species. They are easily recognized from their “horns” or feather tufts on top of their head. We literally look up to this owl, roosted high in the trees. Alberta’s Provincial Bird – in 1977, Albertan children voted to make the Great Horned Owl our provincial bird. The provincial bird symbolizes the magnificent wildlife in Alberta, and the importance of maintaining their habitat for the future. Great Horned Owls are a top predator who feed on mice, rabbits, skunks and even the occasional porcupine. Sponsor a Great Horned Owl to help EALT protect important owl habitat. EALT protects habitat important for Great Horned Owls. A fledgling Great Horned Owl has been spotted at our Ministik natural area and an adult was observed at Boisvert's GreenWoods. Use traps instead of poison when getting rid of mice in your house, garage, or other area. If a mouse eats poison in a building and makes its way outside before passing away, an owl or other predator could capture the mouse and ingest the fatal poison. If you see a young Great Horned Owl on the ground, leave it be. Even though you might not see them, the parents are nearby and will feed the fledgling on the ground. Fledgling owls need to practice and build up muscles before they can fly. During this stage, it is quite normal to stumble across the owlet on the ground. Great Horned Owls sometimes perch on power poles to hunt, rest, or feed. If the power pole is not built to bird-safe standards, the owl can become electrocuted when simultaneously contacting two energized components, or one energized and one grounded component. To help prevent owl electrocutions, call your power company to request that they build new poles, and modify older poles, to meet bird-safe standards. Learn more about bird electrocutions. Great Horned Owls were named for the feather tufts on their head which give the appearance of “horns.” They are one of the larger owls in Alberta with an average wingspan of 101–145 cm (39.8–57.1 in). To identify the Great Horned Owl, look for the distinguishing features illustrated in the photo on the right. Listen to their calls and hoots here. Great Horned Owls are common all over Alberta and are widespread throughout North and South America. These owls do not migrate. They reside all year in forests, open woods, and river valleys of all natural regions. Great Horned Owls are nocturnal so they can be found roosting during the day high in a tree, on sheltered cliff ledges, or in other secluded spots. At night, the Great Horned Owl forages for food in woods, fields, and forest edges. When you are out for a walk in a natural area, it is difficult to keep an eye up high in the trees in search of an owl, because you can easily stumble on roots or other uneven terrain. Instead, look for a pile of the owl’s regurgitated pellets (small oval shaped pods of fur, feathers, and bones) at the base of a tree. If you find this sign, look up to see if you can find the owl. You can also locate an owl by listening to cues from other birds such as ravens or crows – they will noisily harass an owl for hours. A pair of Great Horned Owls may roost together near their future nest site for several months before laying eggs. Pairs mate for life and share the duties of raising owlets. With a plentiful food source in the area, the pair of owls will stay within their territory all year, but they roost separately outside of the breeding season. They usually eat small and medium size mammals and birds, such as mice, rabbits and ducks, but will also attack other larger species, such as porcupine and skunk. In fact, they are the only animal that regularly eats skunk. When clenched, a Great Horned Owl’s strong talons require a force of 28 pounds to open. The owls use this grip when catching prey. Great Horned Owls’ pupils open widely in the dark, allowing them to have excellent night vision. Their large eyes don’t move in their sockets like our eyes, but instead they swivel their head to look in any direction. If an owl starts with their head looking behind them, they can turn their head all the way around to the other side! Some indigenous tribes believe that some Great Horned Owls may be witches who have shape shifted. They believe this because of the powerful, large look of the owl as well as it being mostly nocturnal. Like other owls, the edges of their wings are adapted to make them very quiet in flight, giving them an advantage over their prey. Help conserve homes for Great Horned Owls by donating to EALT today! The majestic Pileated Woodpecker is North America’s largest woodpecker, due to the unfortunate, virtual extinction of the Ivory-billed Woodpecker. If you listen closely in the forest, you will be sure to hear the pileated calling or drumming, and if you’re lucky enough, you may even catch a glimpse of it flying by or hammering on a snag. Sponsor a Pileated Woodpecker to help EALT protect important old growth forest habitat. Our Boisvert’s GreenWoods Conservation Lands is home to nesting Pileated Woodpeckers. This natural area conserves important old growth forest where numerous species of woodpeckers have plenty of snags – crawling with bugs – to feast on. If you live near a ravine, or any woodpecker habitat, you can hang a suet feeder on a tree to help provide food for Pileated Woodpeckers. Leave dead or dying trees standing (rather than knocking them down) in natural areas and green spaces. They provide lots of food for woodpeckers. Pileated Woodpeckers have a loud, shrill piping call with notes that sound like ‘wuk’ or ‘cuk’. It is similar to the Northern Flicker’s call, but is less even tone, with changing emphasis throughout. They also make a deep drumming sound when feeding or when trying to attract a mate in the spring. Click here to listen to the many sounds of a Pileated Woodpecker. You can tell a Pileated Woodpecker lives in the area by their uniquely distinguishable rectangular holes left in snags where they feed. Other common woodpecker species in Alberta leave smaller, round holes when they excavate for bugs. Pileated Woodpeckers are found throughout most of Alberta, in forested regions. They live in mature forest and young forests which are scattered with a supply of large dead trees. You can find these woodpeckers right in Edmonton’s river valley! Pileated Woodpeckers are residents and do not migrate in the winter. They have plenty of food sources to sustain them year round. Pileated Woodpecker pairs stay together in their territory all year. They defend their territory, only tolerating new arrivals in the winter months. Food: mainly ants and other wood-boring insects; also fruits, nuts, and berries. Predators to the nest: martens, weasels, and squirrels, but the adults will guard their nest – which was observed by a photographer watching a nest and an intruding squirrel. Click here to see photos. Predators to the adult birds: some hawk and owl species. The oldest known Pileated Woodpecker was 12 years, 11 months old. You can pronounce ‘pileated’ two ways, with a short ‘I’ sound (pill-ee-ated) or a long ‘I’ sound (pile-ee-ated). A group of Pileated Woodpeckers is called a “crown”. A woodpecker’s head moves 6 m/s at each peck enduring a deceleration more than 1,000 times that of gravity. Scientists have been studying woodpeckers’ skulls to find out how the birds can peck with such force, without resulting in injury to their brain. This research may be helpful in designing more effective head protection for people. Help conserve homes for Pileated Woodpeckers by donating to EALT today! ABMI (2015). Pileated Woodpecker (Dryocopus pileatus). ABMI Species Website, version 3.0. Readers Digest (1990) Book of North American Birds. Pleasantville, NY: The Readers Digest Association, Inc. This uncommon, small diving duck catches our eye in Alberta lakes and wetlands. The male's disproportionately large head - like a buffalo’s (bison’s) head - was the inspiration for its name. Sponsor a Bufflehead to help EALT protect important Bufflehead habitat. EALT protects wetland habitats important for buffleheads and other waterfowl. Buffleheads have been spotted at our Hicks and Golden Ranches natural areas, including a female with ducklings. Build them a home! Buffleheads nest in cavities, therefore installing nest boxes near wetlands can help them find a suitable place to nest. Males are very striking with a large white patch that reaches from cheek to cheek over the back of their dark iridescent head. Females are less boldly coloured and are dark grey-brown with oval white cheek patches. Downy ducklings are black to dark grey with white patched cheeks, and a white throat, lower breast, and belly. Buffleheads don't sound like the usual "quack quack quack" like other ducks. Their vocabulary consists mostly of throaty "grrks", squeaky whisltes, chattering, and guttural "cuk cuk cuks". Listen to a Bufflehead here. Buffleheads are found in lakes and wetlands in the boreal forest and aspen parkland regions of Alberta during migration and the breeding season. It nests in abandoned Northern Flicker cavities within poplar or aspen trees, or in a nest box. Breeding Buffleheads use permanent freshwater small lakes or ponds with abundant emergent and submergent plants. Buffleheads are one of the last ducks to leave Alberta before winter arrives. They overwinter on the Pacific and Gulf coasts, and the Southwest USA. Bufflehead breeding pairs claim a small lake where the female picks a cavity to nest in. Once she lays her eggs, the male departs to a molting ground where he will spend the rest of the summer with other unemployed males. Buffleheads are territorial. Males will defend a female by diving under water and popping up underneath a rival male. Females will defend the water where she rears her young. Male courtship displays involve head-bobbing, flying over and landing into a 'waterski' position showing off his pink legs and shimmery plumage. Buffleheads eat aquatic insects, larvae, snails, small fish, and aquatic plants. They are prey for raptors such as bald eagles, cooper's hawks, peregrine falcons, and great horned owls. Ducklings are sometimes prey to northern pike and gulls. The nest eggs are raided by bears, and members of the weasel family. The oldest known bufflehead was 18 years and 8 months old. A bird-bander in New York recorded this bird. The monogamous pair use the same nest site for several consecutive years. They can stay underwater for up to 24 seconds, only propelling themselves using their feet! Help conserve homes for Buffleheads by donating to EALT today! Birds of Canada. Fred J Alsop III. The Great Blue Heron is a majestic bird that you may have noticed in shallow waters, standing as still as a statue, stealthily searching for food. The Great Blue Heron is the largest and most widely distributed heron in Canada. It holds the record for the largest wading bird in North America. Sponsor a Great Blue Heron to help EALT protect important heron habitat. Our Pipestone Creek and Glory Hills properties are adjacent to Great Blue Heron colonies. Our lands conserve important heron feeding grounds such as a creek, ox bow lake, lake, and small wetland. Do not disturb a rookery. Great Blue Herons return to the same nest sites year after year, so it is very important that heron nests are not disturbed. Help keep your watershed healthy! We all live in a watershed and what we do in our very own yards has an impact on wetlands and waterways nearby. Wash your car at a carwash or use biodegradable soap. Many people do not realize that our storm water systems (catch basins and gutters along paved streets) redirect UNTREATED water to the river or a nearby wetland. Follow directions precisely when applying fertilizers or pesticides to your lawn. Make sure the weather forecast is not calling for rain when you apply chemicals as they will just get washed away, wasting your money and polluting the Great Blue Herons feeding grounds. If you have a backyard fish pond dont be surprised if a Great Blue Heron shows up for breakfast. To deter Great Blue Herons from eating your expensive pond fish, install a decoy heron (which makes for a beautiful yard decoration) next to your pond. Although herons flock on large feeding grounds, they will not share a small pond. Providing hiding places for your fish or covering the pond with netting will also protect your fish from being eaten. Great Blue Herons have a number of different calls to communicate with each other. Their calls range from honks, which are like a high-pitched funny sounding goose, to croaks, which sound like an unimaginable ferocious dinosaur. Young herons begging for food sound like a ticking clock that will persist until their hungry mouths are satisfied. Great Blue Herons are found in every Natural Region in the province, but are less common in the northern parts of Alberta. Herons can be found in meadows or in open shallow water at the edges of lakes, streams, rivers, ponds, sloughs, ditches, marshes, and mudflats. Look in these areas for a tall slender figure - herons stay statue still for great lengths of time while searching for food, making them difficult to spot. Great Blue Herons are migratory birds. Herons arrive in Alberta in late March to early April and fly south in October to early November. A few Great Blue Herons have been spotted overwintering in the Calgary area, near Medicine Hat and Lethbridge, although the majority overwinter in southern USA, Mexico, or even as far south as the Caribbean. Great Blue Herons are lone hunters but will flock on large feeding grounds. Nest in colonies, also called rookeries or heronries. Food: fish, frogs, salamanders, water snakes, large insects, mice, small birds or even plant seeds. Predators: eagles, bears, raccoons, vultures, and hawks prey on the young birds and sometimes even the adults. The oldest known Great Blue Heron was 24 years old. Great Blue Herons benefit from Beavers engineering skills. Beavers stop the flow of water by building a dam which creates a pond. This can eventually lead to the creation of a meadow. These ponds and meadows are prime feeding grounds for Great Blue Herons. There is a Great White Heron, an all-white subspecies of the Great Blue Heron. The Great White Heron is found only in coastal areas of southern Florida. Help conserve homes for Great Blue Herons by donating to EALT today!